If your business is on Facebook, adding a custom landing page can have a big impact on your presence there. A custom landing page can help drive web traffic, add value to your online marketing efforts and increase sales. If you’re considering the types of benefits a custom landing page can create, this post will help make up your mind. 1. Highlight a call to action. One of the biggest points about your landing page should be to direct your audience to do something, whether it’s signing up for your newsletter, downloading a coupon or requesting a free sample. You can use a custom landing page as a way to extend the reach of your lead generating efforts. 2. Drive interest in current promotions, events and products. A landing page can be a great flexible feature area for your web presence. You can generate a buzz around new products there or break news about sales and promotions. Heck, you might even want to test out breaking new information there first to see if it helps grow your network. There are several touted best practices for a Facebook landing page, and several companies (Coca-Cola, Starbucks, Red Bull) that are heralded as having some of the best ones out there. Unfortunately, this spurns a lot of copycats. Try to take cues from what you see as a best practice and add your own dose of originality. 4. Personalize your company in an impersonal world. Facebook profiles without customization can be bland and formulaic. A well-designed landing page will help your page stand out in a land of static templates. A thought out landing page can also help you personally connect to your audience and further brand your platform. Be careful not to simply recreate your web design. Remember, your customers are there to get something unique. 5. Welcome visitors to your page. On Facebook, new fan pages and groups pop up every day. There can be confusion as to whether or not you are on the “official” page of the brand, celebrity or organization you are searching for. A landing page will lend credibility to your platform and reassure your audience they are in the right place. 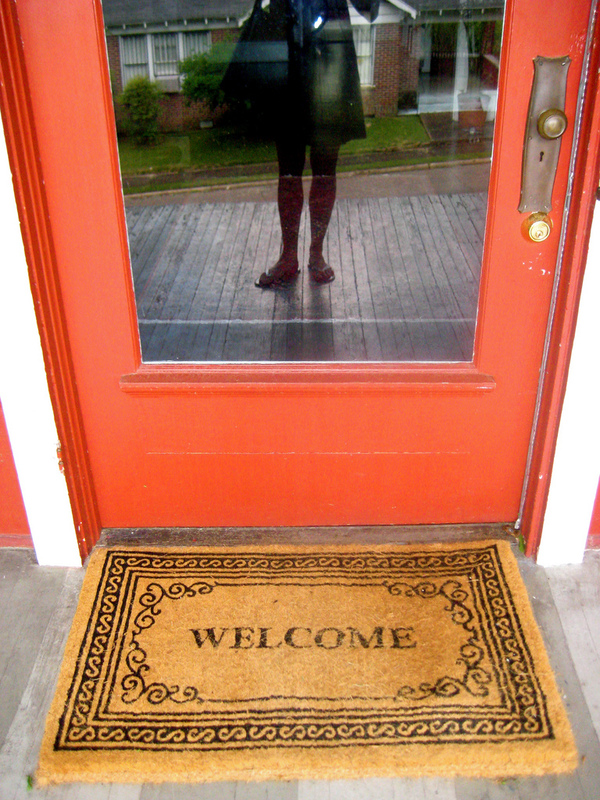 And it’s a pretty cool welcome mat, too. 6. Determine ROI with iFramed landing page tabs. We’ve got news for your accounting department — you can now determine whether or not your Facebook page is directly leading to sales. Several socially savvy companies have caught on to this. JCPenney, Delta and Threadless all have shopping carts iFramed into their Facebook pages. Whether you’re booking public storage spaces or selling software, your Facebook page can act as another direct sales channel. 7. Highlight special offers for “Liking” your page. Once you actually get someone to your Facebook page, there’s no guarantee you’re going to get them to actually click that “Like” button. Use a landing page to give them that incentive. Think about special discounts, coupons or other rewards you can give to your network to thank them for their loyalty. 8. Draw attention to your “Like” button. Let me peface this by saying that I’ve never had a problem locating a “Like” button on a business page. However, there are still valid reasons to embed them in a landing page. Mobile devices, like smart phones and tablets, are quickly evolving into the primary tools people use to access the Internet. It’s now much more difficult to gauge what will appear above and below the fold. Strategically embedding a “Like” button in another spot may make it more likely a visitor will follow your call to action. But don’t go overboard. 9. Showcase your creativity or humor with unique content. A landing page is a place where companies can step outside of their stilted corporate persona and connect with an audience from one human to another. Think of something “off the wall” (Oh, no I didn’t. Yes, I did.) to display the personalities within your organization. Humor is a no brainer. Taco Bell (another company that is mentioned frequently in social media marketing) currently uses its landing page as a Superhero video comic strip. This is the kind of unique value customers are seeking when they become a part of your network. 10. Call attention to your value propositions. By now, your brand has established its value propositions. Without duplicating your website content, use the landing page as a flexible channel to bring attention to the benefits your company offers. One thing to note when you do this however is to not be overly promotional. Eyes will glaze. Back buttons will be clicked. Are there any other selling points you’ve discovered for creating a custom Facebook landing page? Let us know in the comments below. Camella Lobo regularly covers web design, content strategy, social media and more at Above The Fold, a blog by Minneapolis web design agency Internet Exposure. I’ve been focusing more attention on Facebook lately since I set up a page for my day job. We’re interested in capturing the attention of Engineering students and University Professors. I’d love to incorporate an IFramed landing page so the students can sign up for our free memberships. Can you recommend any online tools for this or should I work with our Graphics group to create a page like this? Thanks for all of these tips! Very interesting, I have just written some SEO Training tips on how to optimise your landing page, I thought you might find the information useful and interesting. @ileane and @Erin: Thank you for the comments! iFraming a web application takes the work of a developer who knows traditional code. There has been some back and forth from FB on whether or not they are doing away with FBML. They were supposed to be phasing out existing FBML pages at the end of 2010. This meant that anyone who had a landing page or app created in FBML code would lose it eventually if it weren’t replaced with traditional HTML, java, etc. I would imagine this would have had an impact on anything that was iFramed, as well. Recently FB has announced it will continue to support anything built in FBML but will not allow developers to create new tabs in FBML. @Erin – this article may help allay some of your confusion. It is certainly complicated! Hope it helps. Re: #7- looking for solutions to provide a special reward for liking a company page. Technically, how to connect a like with a special link for only those who click on like? Thanks. PS specifically offering a download or secret page. Excellent post all though I don’t want my competitors to see it, haha. Kidding, I will say that as a small business owner the “likes” to my company FB page have exploded since going with a custom landing page. Can’t even compare the stats between having and not having because 80% of the likes have been since making the switch. Great article Camella, Thanks. I’ve always experienced better conversion rate when i added Facebook fan page on any of page. Visitors always feel something like “Social trust” when they see Facebook fan badge. @ Kim – thank you. It also shows that your efforts in social media are intentional and strategic and that also builds trust with potential customers and new clients. @Extreme John I’m glad to hear your new landing page is working for you. And for a small business, that’s even better news. It tends to be a tougher market. I think as long as you’re offering something dynamic there, those “likes” will continue to grow. @debrafeldman Thanks for the comment. You can send your “likes” a FB message with a “secret” link to your coupon. I’m finding that facebook and other social media sites are a great way to become engaged with your customers. Online businesses (or blogs) do not have the face-to-face option. We’re finding that through Facebook and Twitter we’re getting decent leads, other sites such as Reddit, Digg and Stumbleupon are also generating business, but its less targeted and therefore less fruitful. How do I find out which “title” to have. for instance “community”, “business” for an online healthy living site. Nutrition, exercise, anything to do with health. Thanks! I am overwhelmed with a saturated market!!! Would like to target babyboomers and moms…. Great article.So many useful things for our business when we suft to internet. I recently began SEO’ing Facebook myself and you have great advice listed which obviously I will incorporate. Facebook pages for a business of any kind help to give it a more social appearance. This can provide a significant increase in branding and user trust. Right now I am planning to work on my Facebook page to make it more interesting towards my visitors. This tips of yours will be of very much help. I have gathered lots of visitors everyday after I have change my strategy towards my page that is with your help. Thanks a lot! I never realize that using facebook can be a business and great like a coca-cola. Thanks you Camella for this post. Great post, highlighting the benifits of “linking” is definitly something business need to think about in this day an age. This is really a nice post, so amazing. Many people really want to read this kind of post. this 10 tips is really great.cause i look at the comment of the readers before there all comment is good.that’s why this tips is awesome.thanks cause i know this idea will be useful to me. Thanks for posting this kind of blog. I already learned a lot from this. Thanks for the great tips.It helps me alot. I really like this post so amazing and fantastic. Many people will really hold a conversation on this site because the topic here is very nice. You’ve got some genuinely useful information written here. Excellent job and keep posting superb stuff.thanks and i will comback again here. Doing something different is such great advice. Now since facebook has every grocery store and burger joint on it we have to face it is not as cool as it once was. So just being on facebook is not enough. We have to do something different. Thanks for reminding us of that!! !